My son moves into his first dorm room in two weeks. We talked about decorating his new room. At first he rolled his eyes, he needs time to think, it will be a challenge. This blog is for you, Jackson. And yes my son, fashion and style is portable. 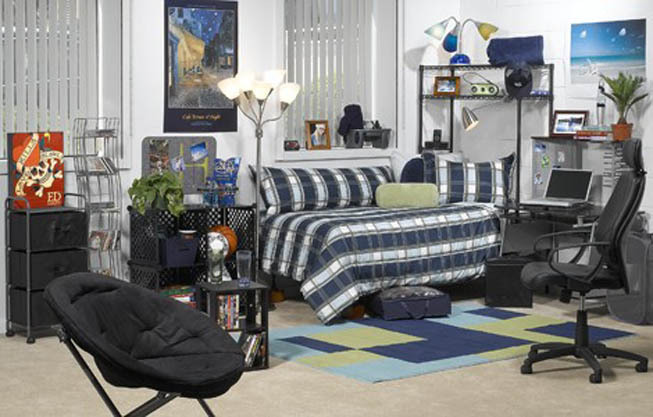 Find out the dimensions and provided furniture in your dorm room and the dormitory rules. These rules may prohibit candles, disallow hanging wall items with nails or thumbtacks, or place limits on the amount of watts your electronics use. Don’t waste your money on items that are already in the room, won’t fit, or won’t be allowed. 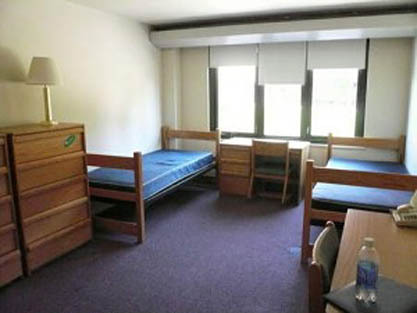 Contact your future roommate before school starts. This breaks the ice and gives you a chance to discuss what items you will each be bringing. It would be a waste of time and money if you are both bringing a mini-fridge, microwave, and bookshelf. This also allows for consideration of each others’ likes and dislikes. For example, if you both enjoy a certain brand, you can coordinate purchases so that you don’t both get the same wall-sized poster. If one of you can’t stand a certain brand, then the other can compromise and save money by getting a more modest poster to hang where it’s not visible to the whole room. The same can be said for color combinations and specific motifs. You may even decide to wait until you get to college and go shopping together. Be creative and use items you already have if possible. Bring as much as you can with you so you don’t have to worry about buying so many new things. If you don’t want to look at the same tired old furniture and decor that you’ve had for so long, spruce it up with some spray paint, throw pillows, or a large piece of fabric that you like. Visit the thrift store for large blankets or curtains to inexpensively cover that ratty love seat. Cut up old posters and magazines and use them to make a collage to cover that boring cork-board. For a special gift to remember the family by, Mom and Dad surprise them with a mini canvas wrap to set on a shelf or desk. Be sure to ask your Hall RA before hanging any wraps on the wall for proper guidelines. We offer a variety of canvas wraps and prints in a variety of sizes. http://www.timeinatreasure.com. Please contact us via our website with questions. By using these tips you will avoid trouble for breaking dorm rules and get off on the right foot with your roommate. You can decorateyour dorm room so that it will feel like a new space for your new life without stepping on toes or spending a lot of money.